Hell is coming to Gigantic. 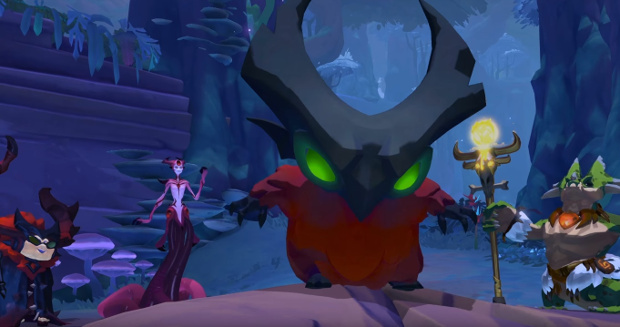 Over the weekend — following Perfect World’s announcement that the game’s developer Motiga would be shuttered — the game’s November update “Infernal Hunt” was revealed. It’s filled with fire and brimstone, and a new family of creatures (demons?) known as the Infernals. As with any family, there’s a lot of different types of Infernals, ranging from the cutest fat little baby-owl looking demon to the skinny goat-like adult. The first set of Infernals (apparently there will be more) are known as Crimson Infernals. These are the ones you’ll see in the video and the image above. To aid the players in their mission to hunt the Infernals, the developers have designed several new weapons and skins… Okay, so I’m not really sure how the skins help with the hunting, but they do make the characters look sweet. The update goes live this week, and if you’d like more information on it, there’s a couple of videos available to watch. The first is the original teaser; short, sweet, and to the point but gives you a good look at the content. The other is an over one hour VOD of the update preview. CHeck them out below!